Temple Run 2 is an endless running game for android as you all know with characters like Usain Bolt, Bruce Lee, Guy Dangerous, Scarlett Fox etc. It has a total of 9 missions with hidden secret artifacts, idols and daily and weekly challenges. In start of the game the daily and weekly challenges are not compulsory to complete, but as you explore the game further and manage to reach beyond level 6 then you have to complete the daily challenges. Temple Run 2 gives us daily challenges every 24 hours on our android cell phones and most the of time you will complain temple run 2 daily challenge not showing. Weekly challenges appear once per week. The Temple Run App uses your android cell phone's clock to deliver new daily challenges once per week. But who wants to wait 24 hours just to play a complete a single objective. I have a trick with which you can complete all the daily and weekly challenges in just one day, all you have to do is to sit and play the game for long hours. Download and install the temple run 2 apk. Enable the data connection. Now open the app and tap 'Menu'. Now Tap 'Challenges'. Here you will see a clock that will show the time remaining for next challenge. Now press or tap the home button and go to 'Settings>System>Date & Time'. Set the time to '11:59 PM'. Now open the game and you will see that the next challenge will start in just less than 60 seconds. After this time frame is over you will see a new daily challenge. If the timer stops at '00:00:00' and you do not see any daily challenges then change the date to the next day while keeping the clock at '11:59' PM. Again open the app and see this time you will get a new challenge. After completing the daily challenge the timer again shows 24 hours. Now again set the clock to 11:59 PM to get the new daily challenge. 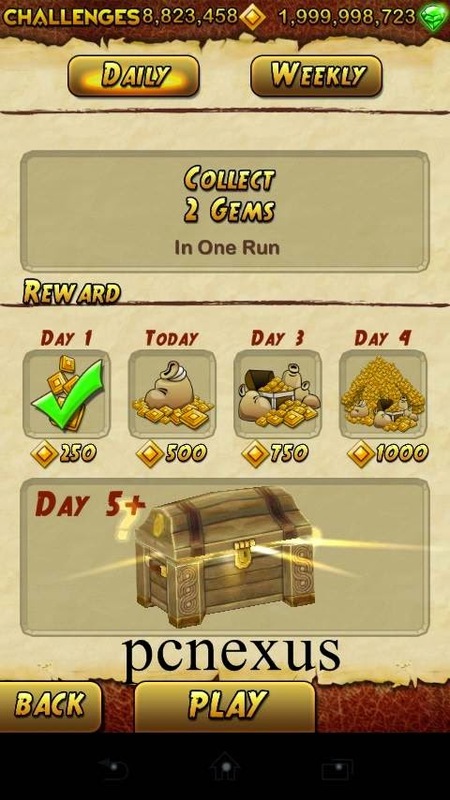 With this trick you can complete all temple run 2 daily challenges in just one day. Also when you keep changing the clock the date also changes and you also see new 'Weekly Challenges'. Now you will not see 'No Challenges This Week' again. Note : When you set the clock to current date and time all the Daily Challenge progress will be lost. 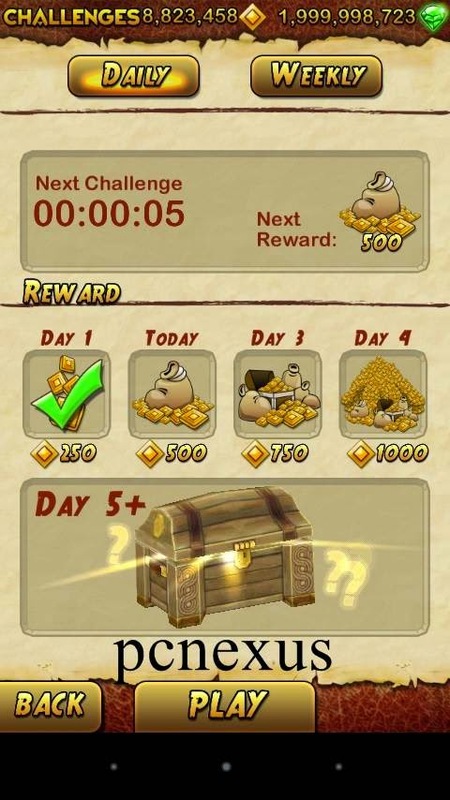 You have learnt the trick to unlock all daily and weekly challenge in temple run 2. I don't know if there's a way this can be fixed. I will really be glad if you can help me out here. That's if there's a way out. It may not work now, because temple run has become more sophisticated. They mostly provide daily and global challenges from their server. We don't have any control over challenges. This also depends on the app version. The temple run running on android 4.4 is little bit different than the one running on android 6.0. I am testing this trick on android 7.0 and will let you know if I get to find a fix for this. Thanks. Please keep subscribed to our email lists and don't forget to join our social networks.